Last week I attended a "legislative coffee" in the town where I live. It was an opportunity for dialogue between state legislators and their constituents. Much of the discussion focused on a controversial education bill that would, among other things, introduce merit pay for 20% of the state's teachers, who generally rank among the most poorly paid teachers in the United States. When some citizens argued that all of our teachers need higher salaries than they currently receive, one of my state senators responded, "I believe in the capitalistic view that people should be paid according to their worth." I was stunned. Surely, I thought, the man hadn't meant to say that. But no, as the fellow rambled on, it became clear that he hadn't misspoken, and I hadn't misheard. From his "capitalistic" point of view, some people are worth more than others as human beings simply because of the work they do. If anybody else was bothered by our senator's remark, nobody let on. The conversation continued without a ripple. Maybe that's because the senator had espoused something that most Americans have come to accept as natural fact--that the value of a human being can be determined by his or her job. But that isn't a natural fact. It's an ideological belief, one that has been too long dominant in our culture; one that has wreaked incredible violence on the lives of our fellow citizens and on our society at large. Recently I heard an interview with the philosopher and activist Grace Lee Boggs. Even at the age of 97 years, dependent on a walker to get around, she's trying to reinvigorate poor neighborhoods in Detroit, a city that's on life-support. She's also trying hard to wake Americans up. She urges us to re-imagine "work." It's not, she reminds us, synonymous with a "job." When work gets reduced to a job, human beings are reduced to laborers and consumers; community is reduced to a mass of individuals; concern for the common good is reduced to preoccupation with self-interest. Real work means far more than having to do whatever we must to make a living, which sometimes feels like selling our soul. We must recover a sense of the dignity and worth of work. If we do that, we'll also recover a sense of the dignity and worth of workers. Grace Lee Boggs' insistence that we need to re-imagine "work" applies just as well to "the market" and "the economy." We need to envision new ways of helping one another survive and thrive, in community. Alternatives to the prevailing economic model are certainly out there in America, at least on a small scale. 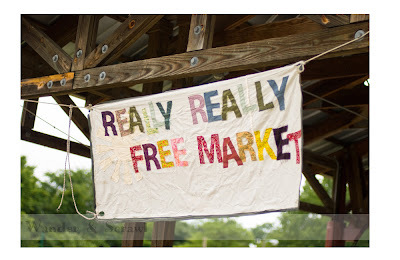 Some of them are called "solidarity economies"; others are described as "gift economies." Both types have existed in some form or another, somewhere in the world, for thousands of years. They aim to meet the needs of all members of a community instead of a select few. Instead of being rooted in a "survival of the fittest" mentality that prizes the maximization of profits for private gain, and which does not hesitate to plunder natural resources, these economies are grounded in the values of respect, cooperation, democracy and environmental sustainability. In both these types of economies, human beings have inherent worth and dignity. Their value is not determined by their labor, but by their very existence. The economy and its various markets (including the labor market) are regarded as tools for the maintenance of the community, rather than the community being regarded as a tool for the maintenance of the economy and its markets. This is a crucial difference. The former affirms and sustains life, the latter commodifies it. Examples of solidarity economies include community-controlled credit unions, food-buying cooperatives, and community land trusts. Gift economies, which have been especially common among indigenous peoples, focus on the welfare of the collective; they involve resource-sharing based on need. A good illustration of such a gift-based, non-commercial market is a "Really Really Free Market," held weekly or monthly in a public place. Members of the community are welcome to bring to the RRFM things they no longer want or need, and to take away things that they do. Everything is free; nothing bought, nothing sold. Such markets sometimes also offer services like hair-cutting, lawnmowing or oil changes. Food and entertainment may also be available. Every market takes on a life of its own, grown as it is in the soil of its own community. In the video below you can hear a "free marketer" reflecting on his experience in Pasadena, California, just one of dozens of cities around the United States where such markets have emerged. If I can round up some folks to help me, I'd like to consider starting a free market in the town where I live. Maybe you could get one going where you live, too. From what I can tell, it should be fairly easy for us to do. Basically we just need to find a public space in which to hold the market, set a time to do it, and spread the word. If we manage to get a Really Really Free Market going here in Brookings, South Dakota, I'll let you know. Maybe I'll even send a special invitation to my state senator to come and join us, according to his worth.